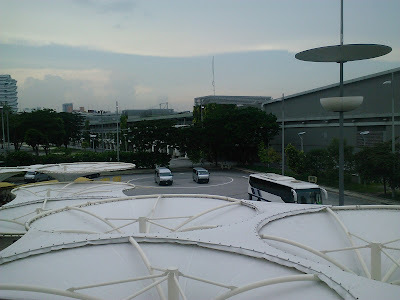 When you visit the Marina Bay and the Marina Centre area, I can bet you that you can find a ferris wheel type of thing from afar. 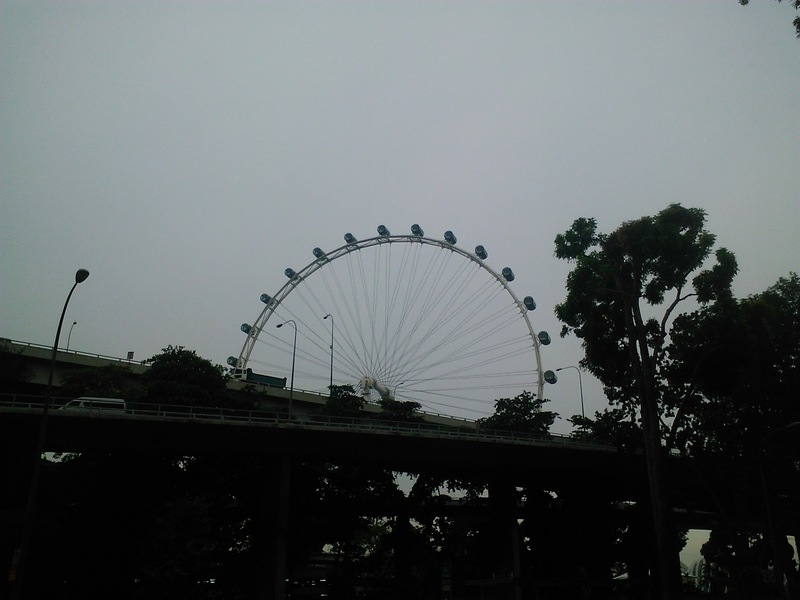 That ferris wheel thing is actually the Singapore Flyer, also known as one of the world's largest observation wheel. It's like a ferris wheel that you can find in carnivals but an observation wheel is bigger, taller and has 'capsules' which are air-conditioned and gives a panoramic view of the whole city of Singapore. In today's article, I'm going to give you a tour of the Singapore Flyer building. The actual ride itself will be done on a later date. Here's how the Singapore Flyer looks like at Temasek Avenue. The Singapore Flyer is located at one corner of the Marina Centre area and it's just right beside the F1 Pit Building and the Marina Promenade at Raffles Avenue. 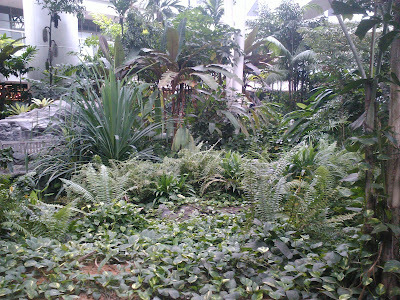 It's also located just right opposite to Gardens By The Bay and the Marina Barrage. 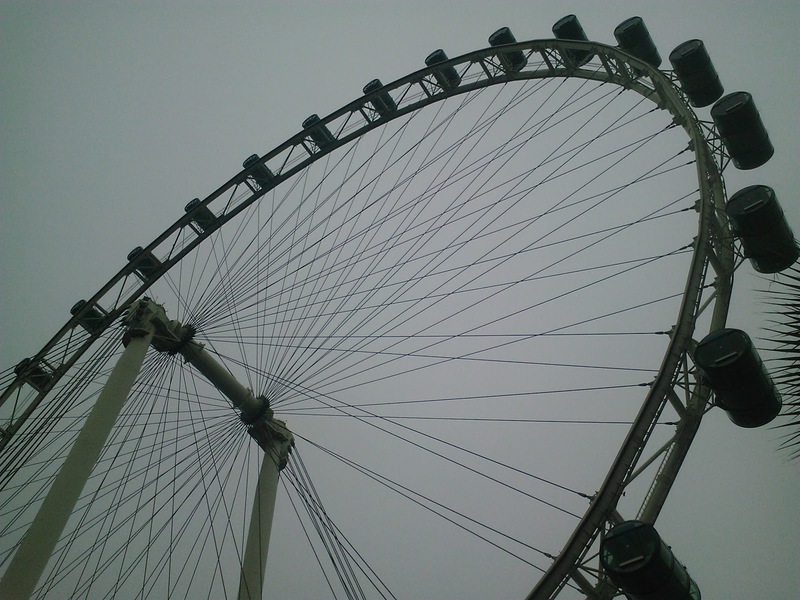 The Singapore Flyer first opened to the public in 2008 and it's one of Singapore's famous attractions attracting people from all over the world. 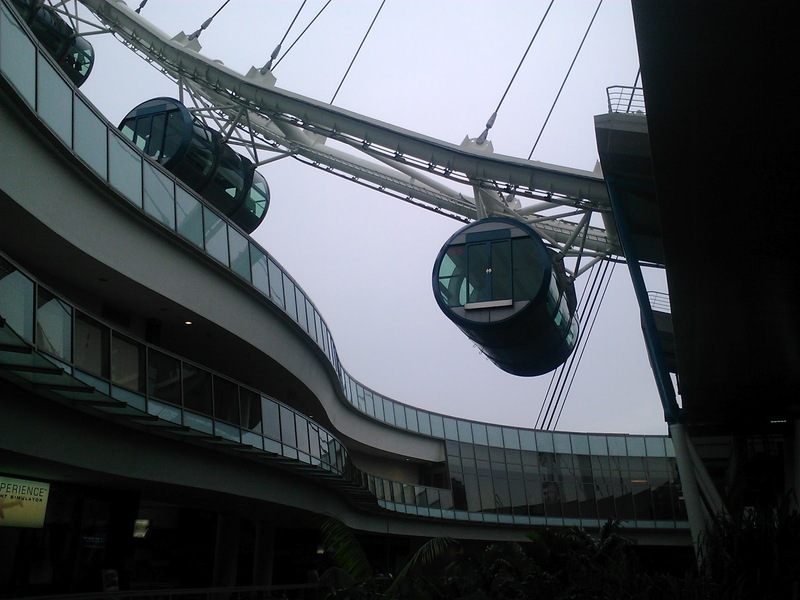 Competing observation wheels include the famous UK's London Eye, China's Star of Nanchang and the slightly shorter, Canada's Niagara SkyWheel. The Singapore Flyer stands tall at 165m and each ride will take about 30 mins and visitors to the observation wheel will get to check out a gallery about the Singapore Flyer called Journey of Dreams. Like I said earlier, this article is about the building itself and not the Singapore Flyer ride. 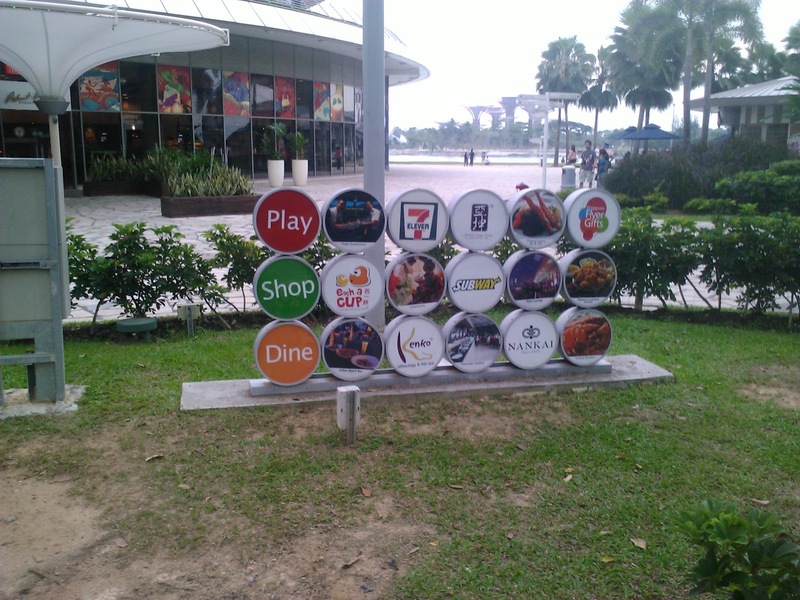 The Singapore Flyer building has a wide array of shops and restaurants and also some attractions that are both free and paid. Just right near the entrance, there's a fast food restaurant selling delicious fried chicken and biscuits which originated in the US known as Popeye's. 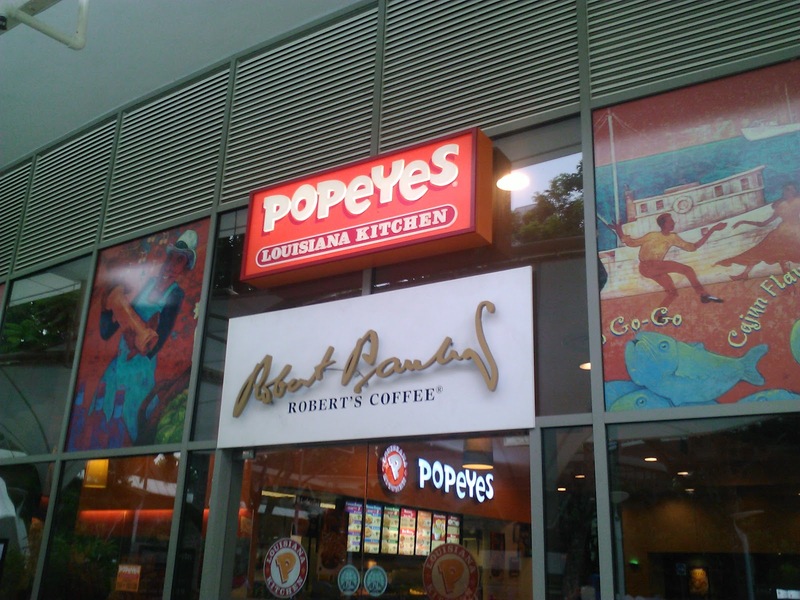 Popeye's restaurant at the Singapore Flyer is one of the first outlets to be opened in Singapore, the other being Singapore's Changi Airport. I love their fried chicken because they're crispy, juicy and just plain delicious. Their fries can't be beaten and also, they have one of the best Mashed Potatoes with mouth-watering gravy, spices and tiny bits of chicken. I'll do a write-up of Popeye's Chicken soon if I can. 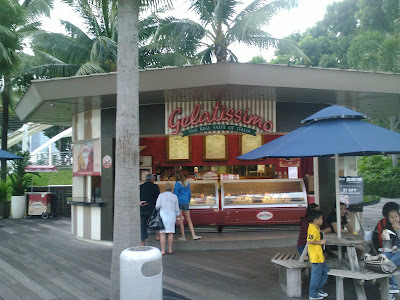 Moving on, right outside Popeye's Chicken, there's a small shop selling Italian ice cream known as Gelato. 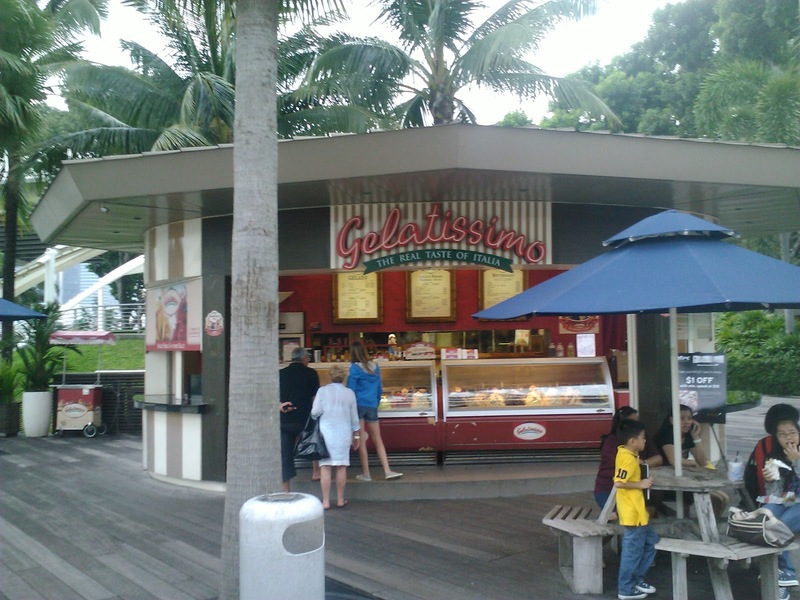 It's called Gelatissimo and it's also located islandwide at places such as Shaw Lido. Right behind the Gelato shop is the Greek Theatre. 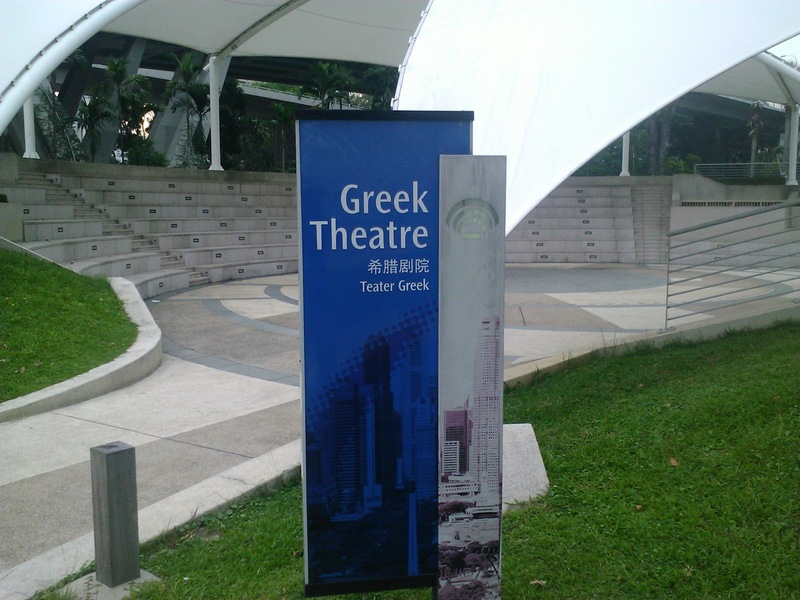 The Greek Theatre is a space specially for events. Some events take place here such as live performances and concerts. 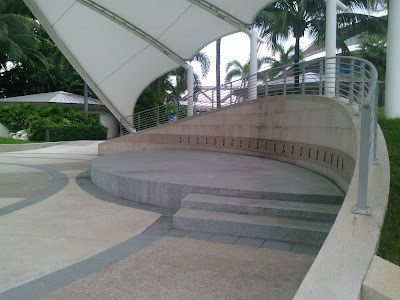 The place is open air and has a great view of the sea and Gardens By The Bay on the right side (if you're sitting down). 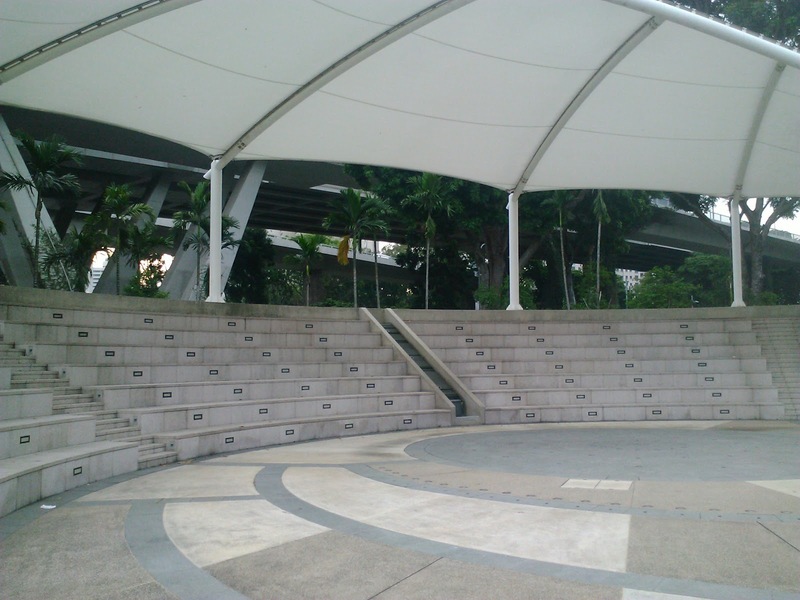 If there are no events taking place, you can have a picnic over here. You can buy some Popeye's Chicken and Gelatissimo Gelato and sit down here at the Greek Theatre. Now that's a good idea for a date or for a family gathering on a budget. 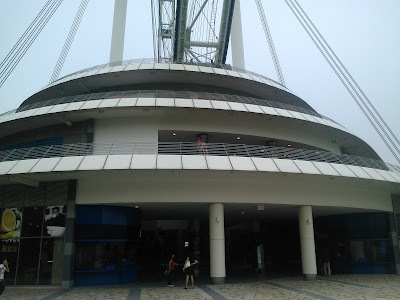 Here is how the Singapore Flyer building looks like. The building has this topographical layout which is rather unique and not seen anywhere else. 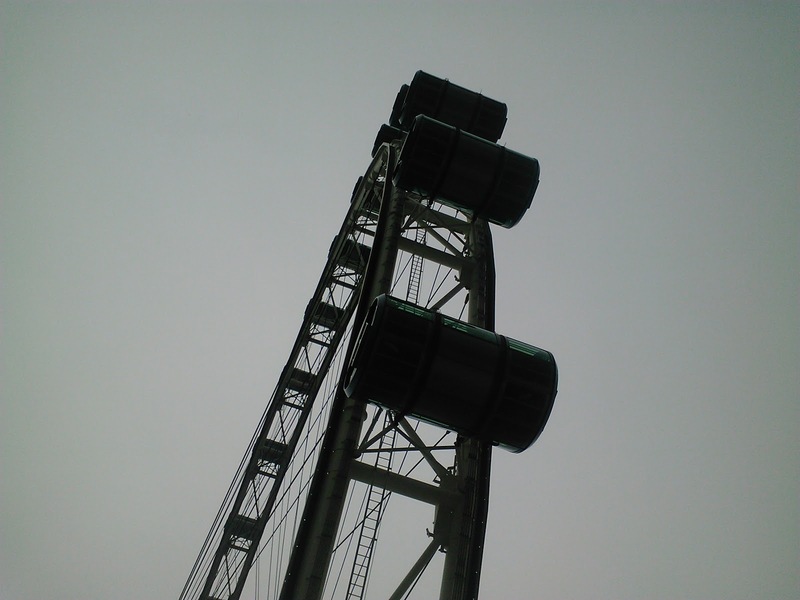 If you get to ride on the Singapore Flyer, you can see the topographical shape when the capsule's going up. 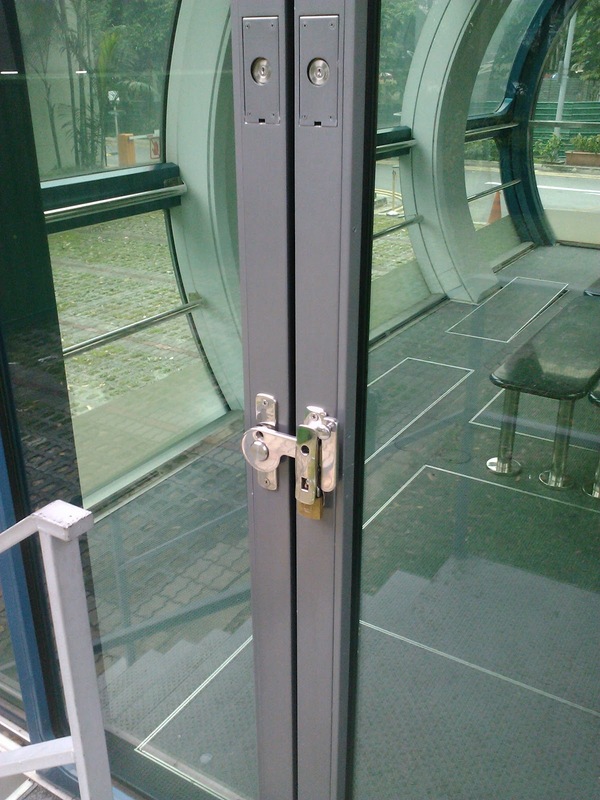 The building has only three levels. The first two levels are accessible to the public while the third level is only for ticket holders. The third level is also where passengers get to board and alight the Singapore Flyer capsules. 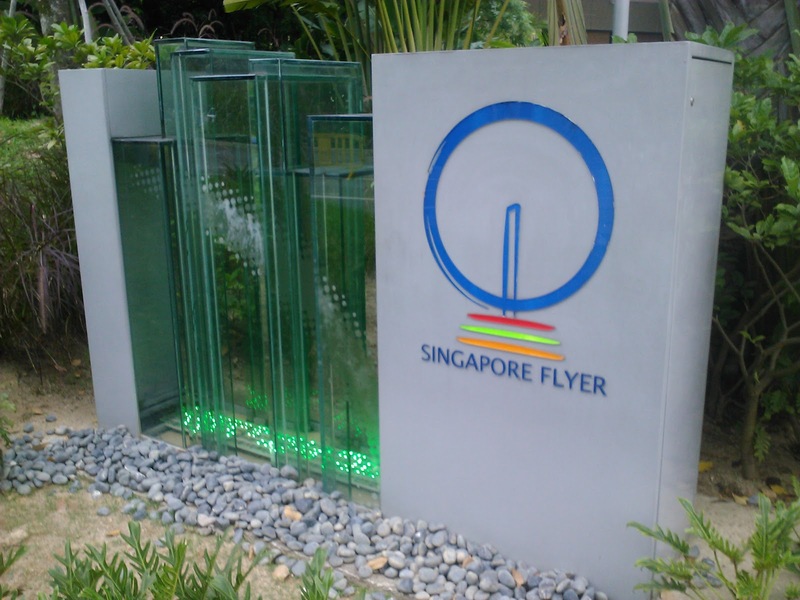 Don't worry if you don't yet have the money to ride on the Singapore Flyer because there's a free attraction on the first level that you can check out. 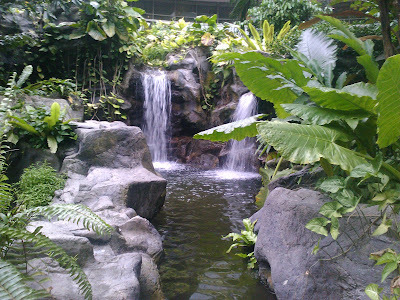 It's the Rainforest Discovery fully equipped with a Koi Pond and lots of greenery. There are a heck of a lot of trees and shrubs that are found in the Rainforest Discovery. 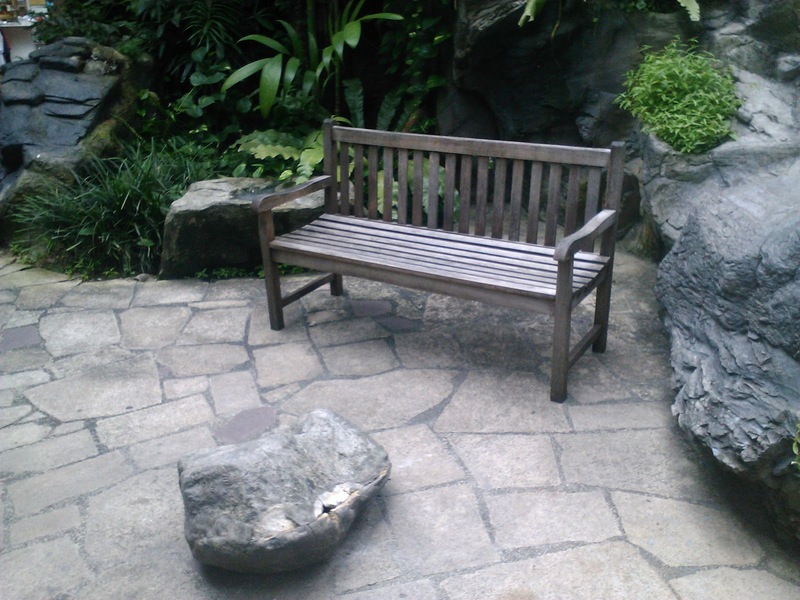 Just take a walk around and you'll know how serene and peaceful this place is. 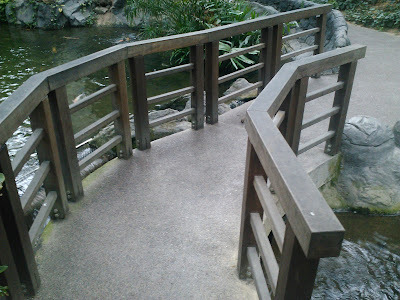 There are also tiny wooden bridges in the 'rainforest' that allow you to cross the stream easily. Short man-made waterfalls are also present in the rainforest. It's great that they have a piece of nature in the middle of the building and right underneath the observation wheel. 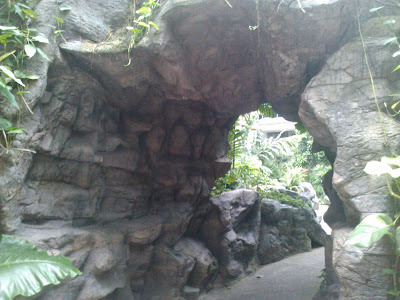 The entrance itself looks like you are entering a cave. 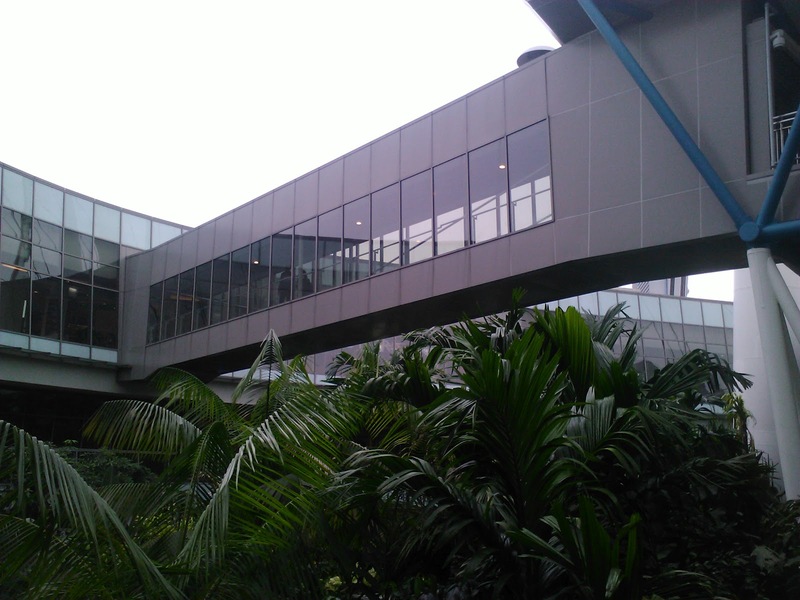 There are plenty of space for walking along the walkways. 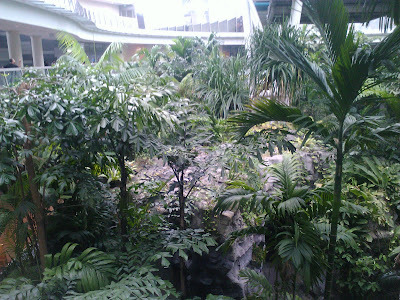 So bring your family along to the Rainforest Discovery. 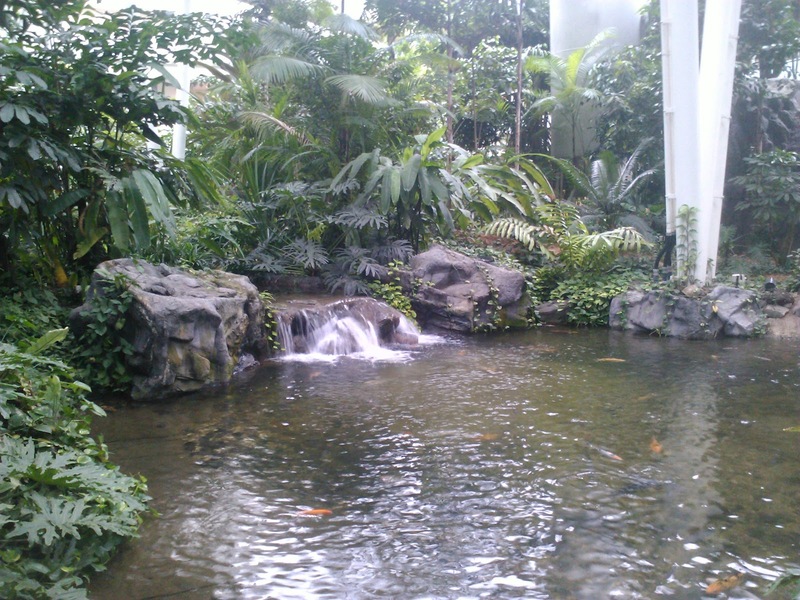 Another activity you can carry out at the Rainforest Discovery is fish feeding. Above, you can see a picture of the vending machine that dispenses the fish feed. 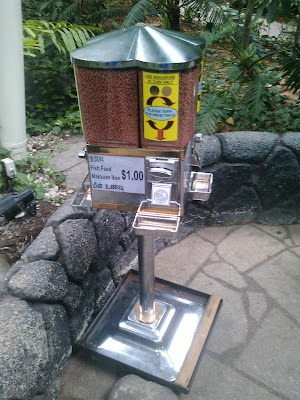 It costs $1 and it's quite a lot for $1. 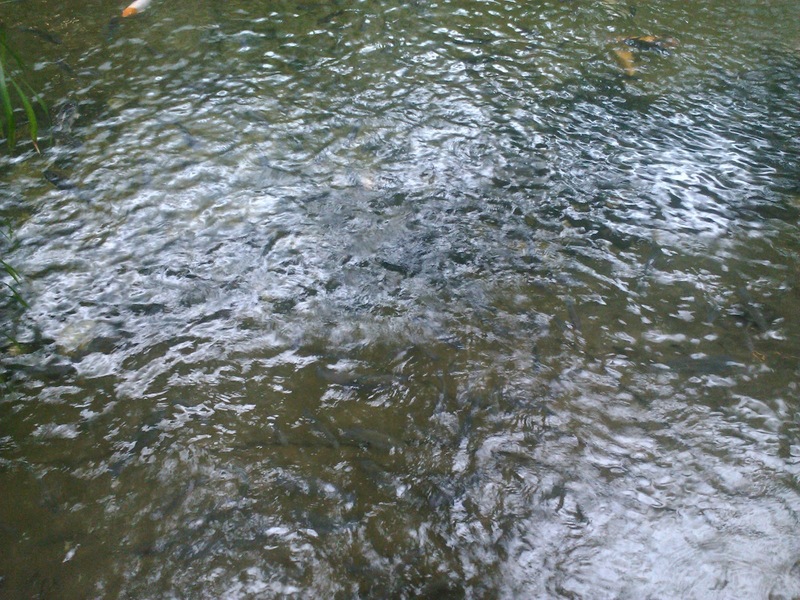 At the pond, you just have to throw the fish feed into the pond and check out the fish compete against other fishes to get the food. It's an interesting and inexpensive activity that's fun to carry out. Just be careful not to jump inside the pond and you must throw the fish feed otherwise it will get stuck at the rocks if you don't throw with force. At the Rainforest Discovery, if you look above, you get to see the Singapore Flyer capsules up close and personal. 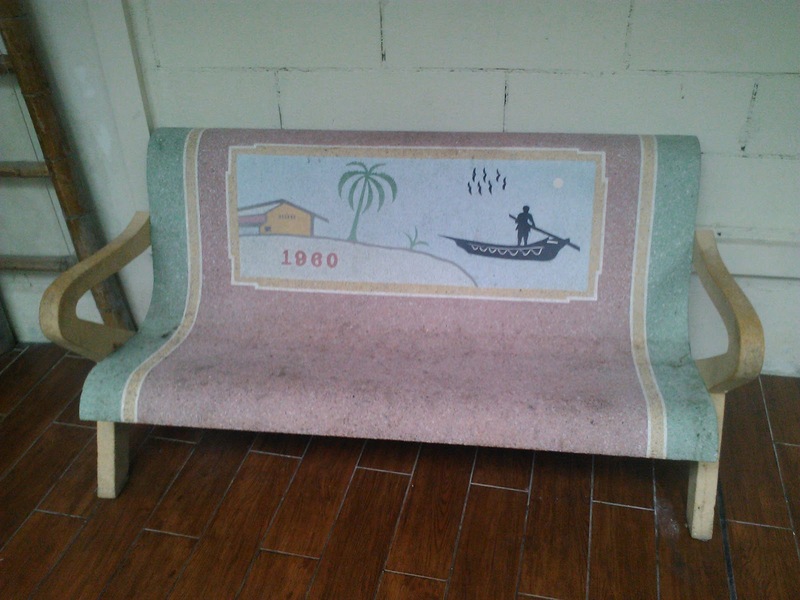 Plus, you also get to see the boarding and alighting of passengers. Notice that there's a net right below the Flyer capsules? Most probably it's to prevent people from falling into the rainforest. Better be safe than sorry. Moving on, I'm going to show you one of Singapore Flyer's newest eating establishments which is the Singapore Food Trail. Back in the 1960s, lots of hawkers set up road side stalls and serve food and drinks to diners on makeshift tables and chairs. It was only until a few years later when the government decided to step up their food safety measures and closed down the illegal roadside hawker stalls and replaced them with hawker centres. 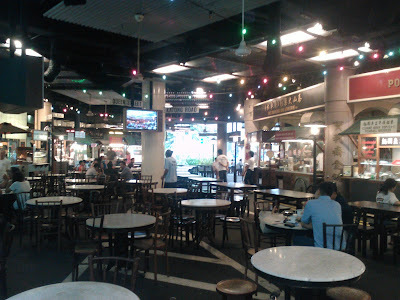 Hawker centres are available islandwide in Singapore and it's one of the places where one can get cooked food and raw food (at the market, of course) in affordable prices. 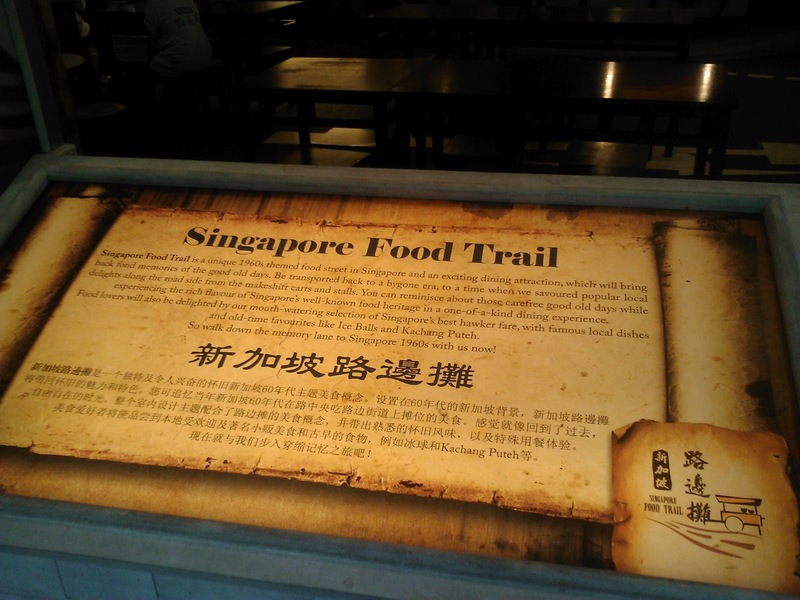 The Singapore Food Trail resembles a 1960s food street as you can see from the picture above. 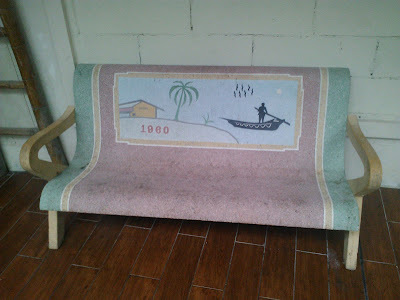 The floor resembles Singapore roads in the 1960s and the tables and chairs look the same as those makeshift ones that are found in the 60s. Apart from that, the Singapore Food Trail also has old black and white signboards of noteworthy Singapore roads before the green one came to replace them. 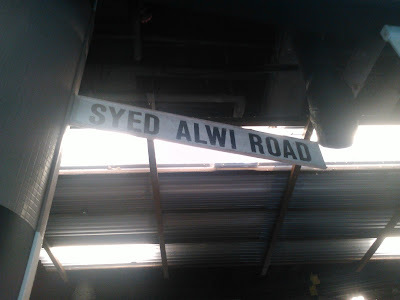 Do note that the black and white signboards are in fact real and they have all been phased out a few years ago. 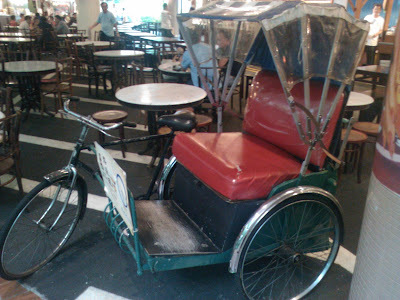 The Singapore Food Trail's stalls also resemble the old hawker stalls and there's also a mock up of a trishaw that used to be a transport option back in the olden days. Posters of old drinks like the one shown are also pasted up. 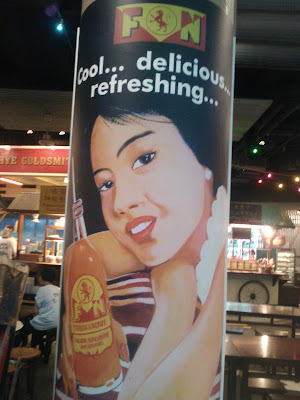 (The F&N Orange drink still exists although it has a different bottle design now). The food court offers Singapore's famous dishes such as Nasi Lemak, Laksa, Goreng Pisang, Chinese Noodles and so much more. 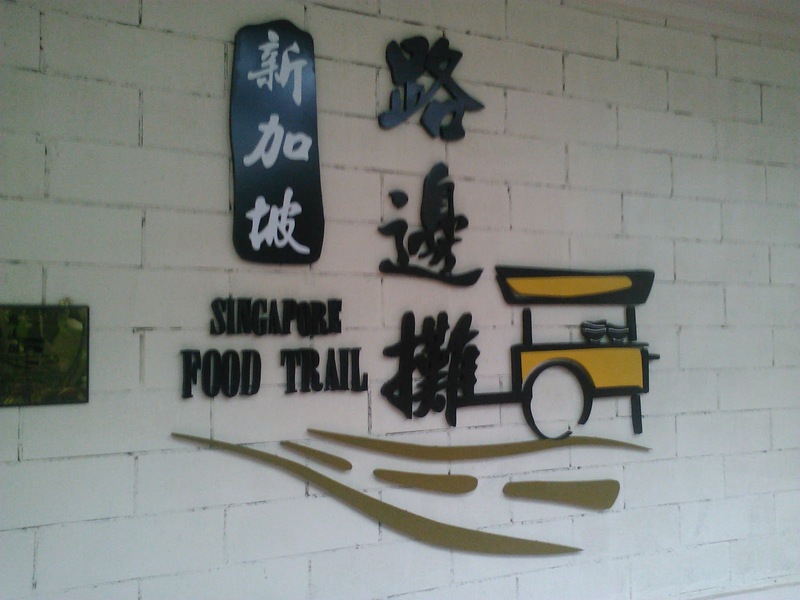 Most of the stallholders have their second outlets here whereas their other outlets are available at various Singapore hawker centres. 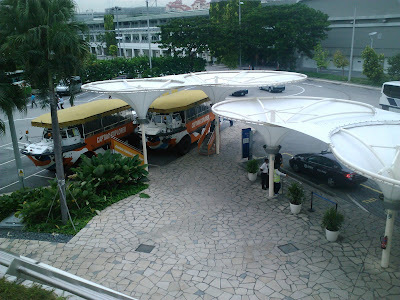 The Singapore Food Trail is made to resemble the 1960s and will totally bring back memories for a lot of people. Now let us move on to the 2nd level of the Singapore Flyer. 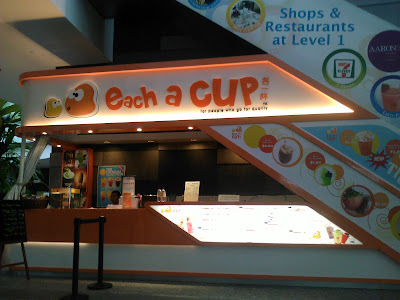 There are more shops and retail outlets available here and I came across this store. 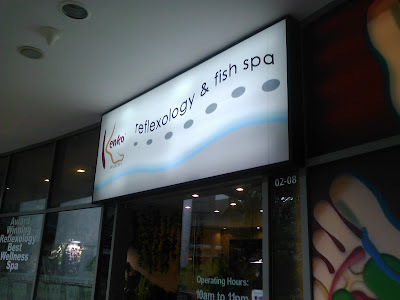 It's Kenko reflexology and fish spa. If you don't know, basically its a spa but unlike typical spas, you put your feet into a fish tank and tiny little fishes will bite into your feet. 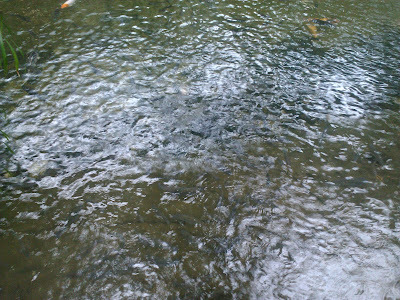 They'll eat away all the dead skin cells you have on your feet. 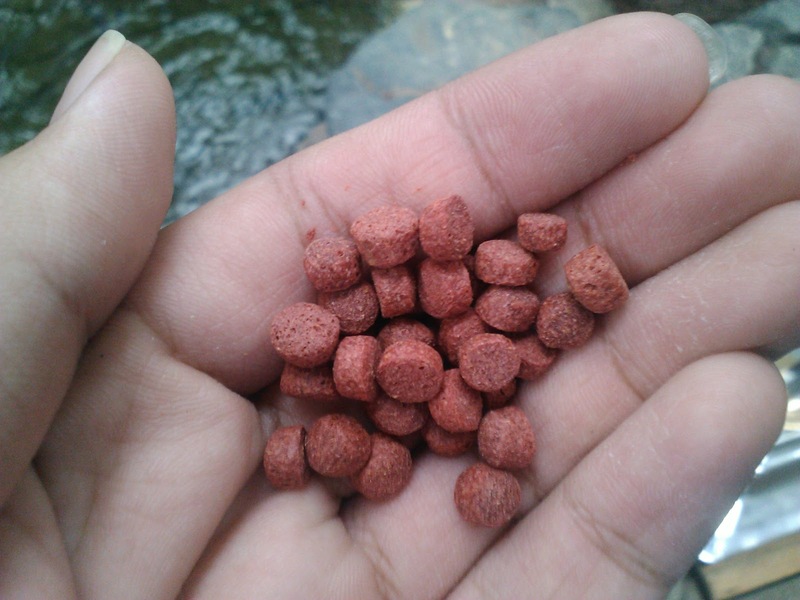 These little fishes will help you regrow healthy skin and if you are the squeamish type of person, you should come here to not only face your fears but also to help regenerate healthy skin. 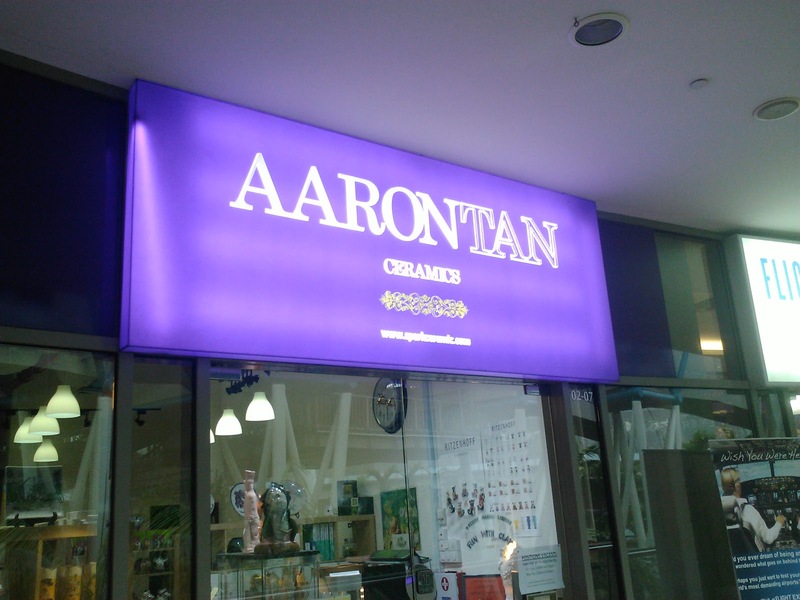 Another retail outlet to take note of is Aaron Tan Ceramics. From the outside, it may look like a messy place to be in but it's actually a class that teaches visitors more about ceramics. Visitors will be able to learn pottery-making, making their own mugs and more. So, if you're interested in this kind of handicraft work, do give Aaron Tan Ceramics a visit. It's also a great place for family bonding. 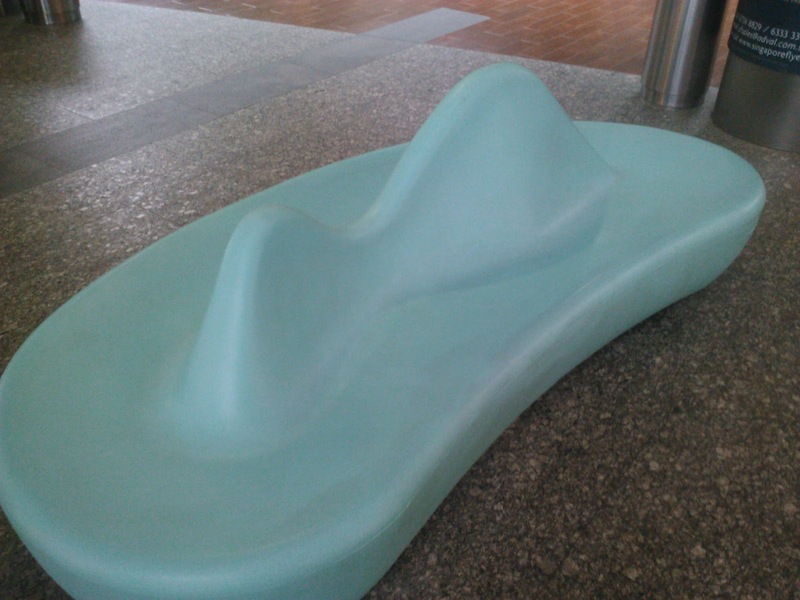 Apart from Aaron Tan Ceramics, there is also Flight Experience. This is the place where you get to pretend to be a pilot and also, fly a plane without actually flying a plane. At Flight Experience, you get to fly a Boeing 737 airplane with the help of a simulator cockpit so it actually feels like you are flying for real. 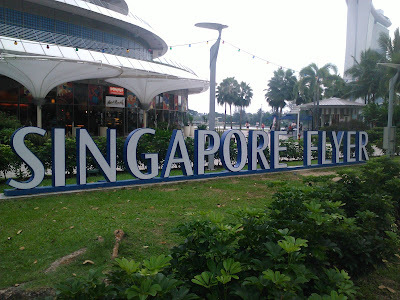 There are various packages Flight Experience offers such as the Scenic Flight, City Circuits Flight and the most popular of them all, the City Flyer Flight. There are more packages available and flying classes if you are into that sort of thing. The prices are not cheap though but it may be money well spent. 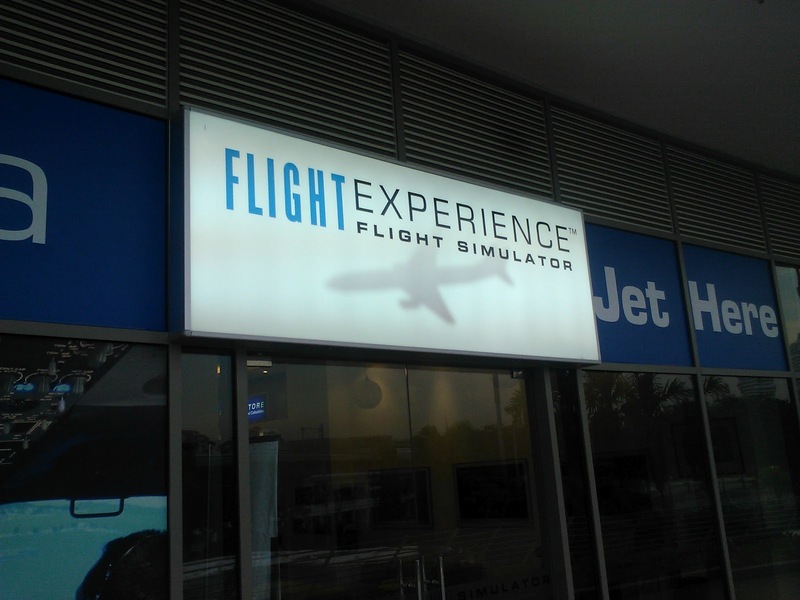 I wish I have the money to fly the simulator. 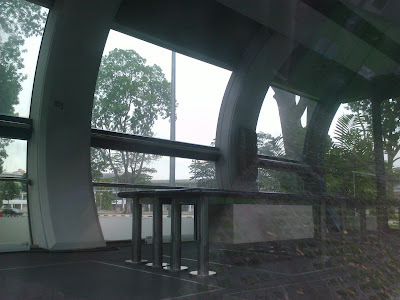 Here are some interesting photos that I took during my visit to the Singapore Flyer building as seen from the 2nd level. 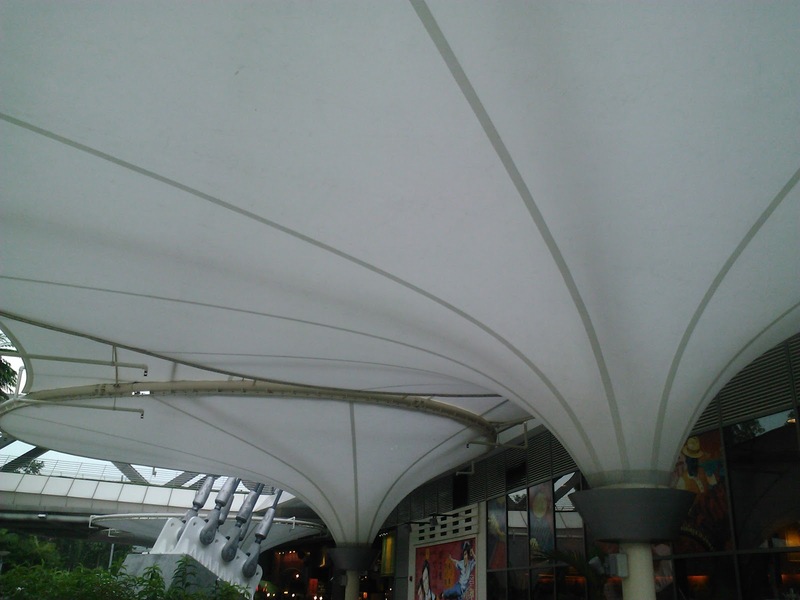 I love the shape of their shelters. 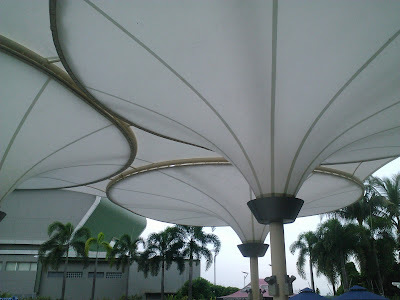 They look like upside down umbrellas. 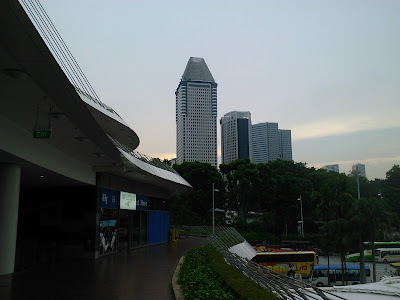 See if you can spot the F1 Pit Building, DuckTours boat and the Marina Centre towers. Here's some more pictures. 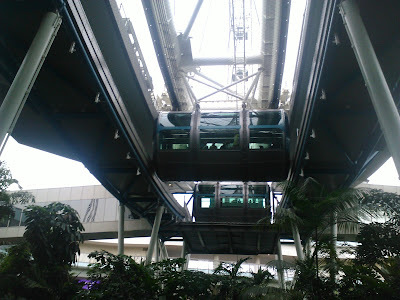 The first picture is the Rainforest Discovery as seen from the second level and below are pictures of the Singapore Flyer capsules in action as seen from the second level along with the bridge that will lead passengers to the gift shop. It's too bad that the clouds disappeared and the sun was also going to disappear too. Well, it's time for a break. Back at level one are these interestingly shaped plastic seats that visitors can rest on after exploring the whole Singapore Flyer building. 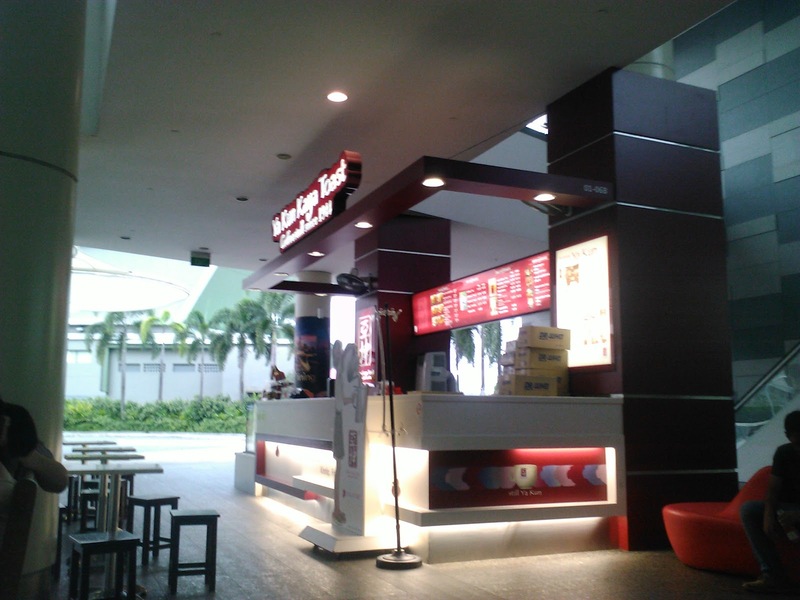 Visitors can also try delicious Kaya Toast or Butter Sugar Toast along with a cup of tea added with evaporated milk at Ya Kun Kaya Toast which is near the escalators leading up do the 2nd level. 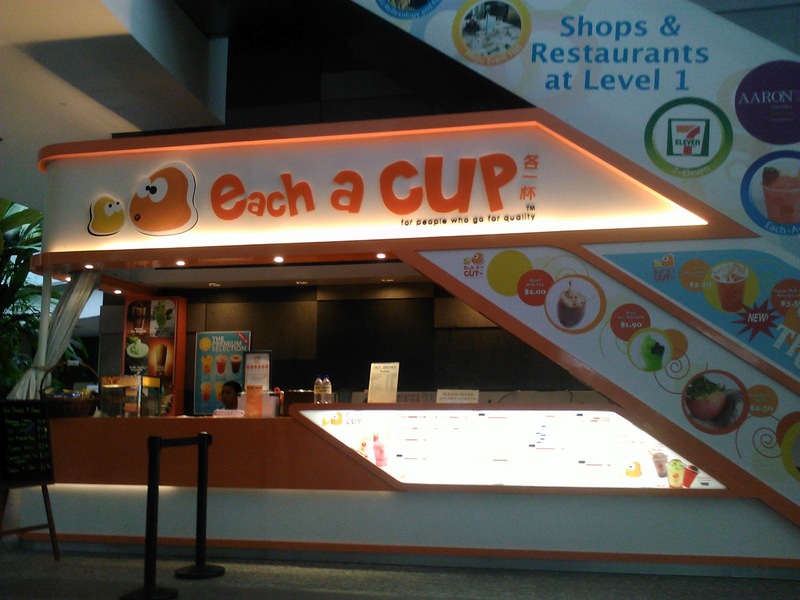 A bubble tea shop selling bubble tea called Each A Cup is also available if you're not into hot tea with evaporated milk. Above is a close up view of the oddly shaped shelters that resemble upside down umbrellas at the Taxi Stand. 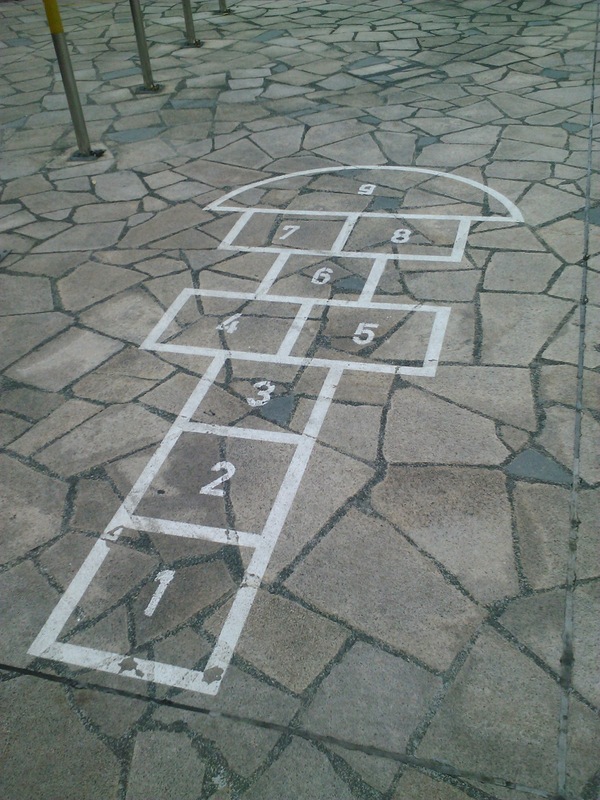 At the back of the Singapore Food Trail is a game of hopscotch. 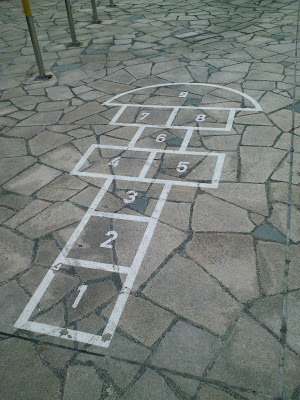 It's a traditional game commonly found in the 1960s whereby someone will throw a stone to a numbered square and you have to hop on one foot all the way to the numbered square with the stone on it. After that, you will have turn back and hop on one foot all the way back from where you started. It's simple yet fun. Now this is something interesting to look out for. Right beside the Singapore Flyer carpark exit near Marina Centre Bus Terminal is a lonely capsule. It's not a mock up or anything, it's a real Singapore Flyer capsule. 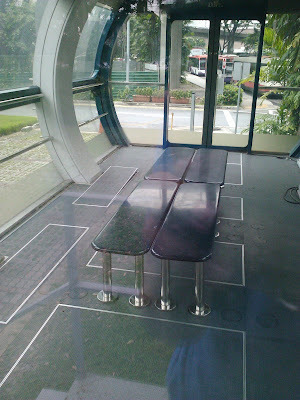 There's a small staircase leading up to the entrance of the capsule and inside, you can see the seats and the TV screen. Too bad it's locked up and inaccessible to the public as this can be a free alternative to an actual Singapore Flyer flight but it's immobile. 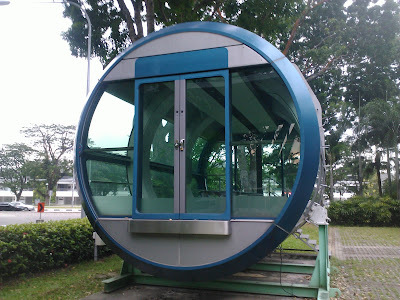 Most probably this capsule is a back up capsule and if let's say there's a fire happening in one of the capsules, they can replace that with this. So I guess it's a precautionary measure. Still, it's interesting to see the capsule this up close and personal. Here are two more photos of the Singapore Flyer. The one above is the observation wheel in action from Promenade MRT Station and the picture right below it is the welcome signboard which will light up at night. 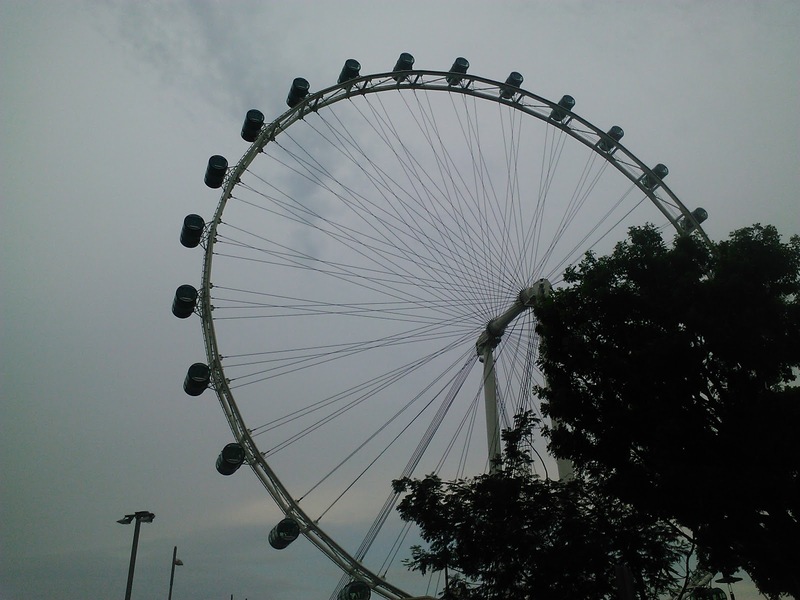 The Singapore Flyer is a great attraction worth checking out. 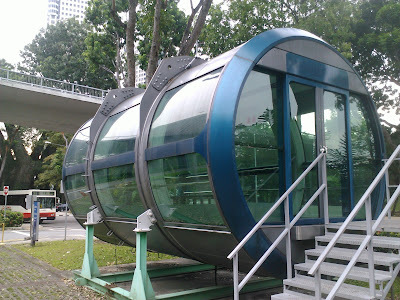 Apart from the flight in one of the Singapore Flyer's capsule, there are lots more things you can do at the Singapore Flyer building such as eating fried chicken, eating popular local dishes, feeding fish, having fishes eating your dead skin cells, fly an imaginary plane, making your own ceramic mug and so much more. 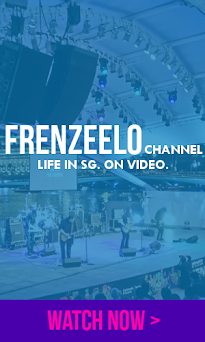 The Singapore Flyer is a great place for family and friends. In the future, I will write a post on my 30 min capsule flight at the Singapore Flyer if it's possible. Thanks for sharing. Stir up my curiosity and interest. I will go exploring some day.